The Class of 2020 experienced the fiercest competition ever for admission to Ivy League and other top universities. Overall, Ivy League schools had an average acceptance rate of only 8.4%. This means that approximately one out of every 12 applicants was extended an offer of admission. Since many of the students these schools accept are legacy students, recruited athletes, and underrepresented minorities, for the “normal” student population, gaining admission is even more challenging, and the acceptance rate among this population is significantly lower than the reported 8.4% average. The question is, What can you do to increase your odds of acceptance? Working closely with our team will get you on a strategic plan with actionable items that will significantly increase your odds of acceptance into Ivy League and other highly selective colleges and universities. Samuel B. Silverman, our founder and one of our Managing Directors, successfully gained admission to multiple Ivy League and other highly selective schools as a non-minority, non-legacy, and non-athlete who attended a private school in a metropolitan area. For almost 10 years, he has successfully helped competitive students like himself gain admission to selective schools with a 100% success rate of getting students into at least one of their reach schools. Competition for selective colleges is undoubtedly at an all-time high. Over the past 8 years, the average number of applicants to Ivy League schools has consistently increased, and the average acceptance rate has consistently decreased. 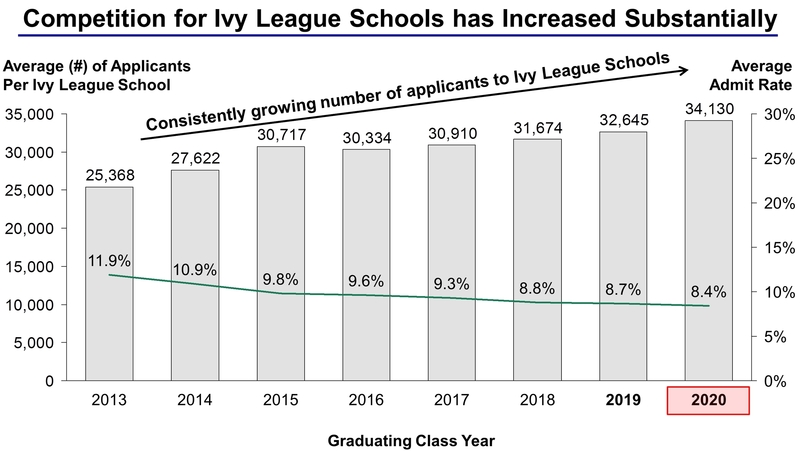 This is a simple illustration of supply and demand—the number of spots available for students at Ivy League Schools has remained steady and the number of applications for those limited number of spots continues to increase. This trend of decreasing acceptance rates will continue as the number of applicants continues to increase in the future, driven primarily by generous Ivy League financial aid policies for lower income students and an increased number of qualified international applicants. Gaining admission to an Ivy League school several years from now will certainly be more difficult than it is today. Given this, the “bar” will be even higher for students to stand out from among the competition and gain admission to these prestigious and highly selective schools. If you are a serious student—or the parent of a serious student—interested in attending an Ivy League school or another highly selective college or university, please contact our team for an initial consultation. This comprehensive evaluation will help determine how an admissions committee will view your admissions profile and accomplishments as well as how your profile will compare with other highly qualified applicants.